OUR PARTNERS: Produce Shows – Bring Faith to Family – Empower others to invite God into their lives – Transform parents and families through God – Prevent life-long tragic choices and consequences for parents, children and families. Click the O Check for Electronic Check or EFT meaning you do not have to write checks as your bank automatically transfers the funds saving credit card processing fees. Safe and Secure with all donations processed through Paperless Transaction Corporation. A portion of all donations go to Parent Compass Outreach for humanitarian needs. Parent Compass, Christian Life & Family Show. You can help parents, children and families. *$10 including free shipping within the United States. Not guaranteed outside of U.S.
Tween girls have access to an unbelievable amount of media and information with just a simple click of the remote or mouse. Every outlet they turn to attempts to subtly influence their worldview…and what they believe about themselves directly affects how they live. 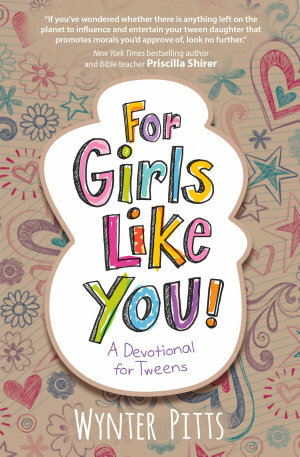 Wynter Pitts, founder of For Girls Like You magazine, gives girls a new devotional showing them a correct definition of themselves, opening their eyes to God’s truth and the difference it makes in their lives. Each daily devotion includes a prayer to help girls apply the lesson.